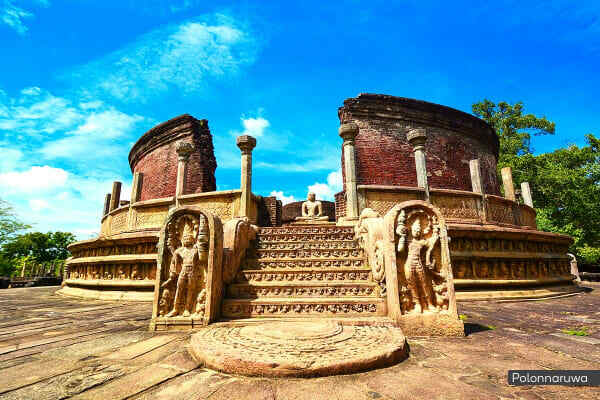 Experience Sri Lanka in all its glory on this incredible 12 day tour, taking you through buzzing city centres, ancient marvels steeped in thousand year old heritage, elephant orphanages, wildlife safaris and stunning white sandy beaches. Whether you’re on a budget or love a little extra luxury, choose from two accommodation options to experience Sri Lanka the way that suits you best. 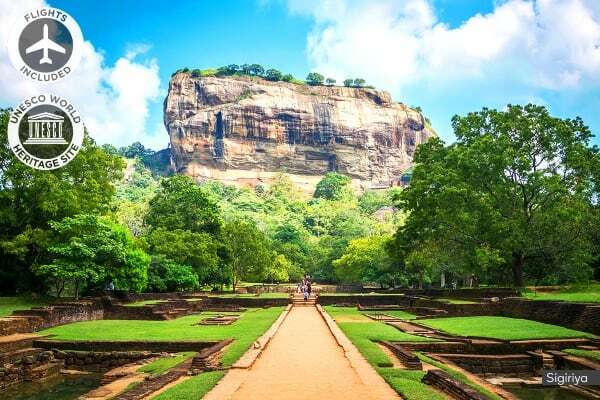 Scratch the surface of Sri Lanka’s diverse beauty on this spellbinding 12 day tour, jam-packed with tropical wonders, stunning wildlife, hillside views and pristine white sandy beaches. Get up close and personal with adorable baby elephants at the Pinnawala Elephant Orphanage where you’ll get to nurse a baby elephant with a milk bottle and watch it bathe in the river. Climb the lion staircase to the peak of Sigiriya (Lion Rock) where thousand year old scriptures scribbled on ancient stones and breathtaking 360° views of lush landscaped gardens await at the summit. Visit Sri Lanka’s most important Buddhist spiritual helm at the Temple of the Sacred Tooth Relic in Kandy, housing the tooth of the Buddha in a guarded golden casket. Play eye-spy with Sri Lanka’s stunning wildlife on a jeep safari in Yala where you can feast your eyes on leopards, elephants, buffalo and more! Recharge and rejuvenate from your Sri Lankan adventure with a two night stay in the beachy playgrounds of Bentota and Beruwala, letting the palm trees, ocean breezes and tranquil jungle sounds sway you into relaxation. Pack your bags for an action-packed adventure as your board your international flight to Colombo. 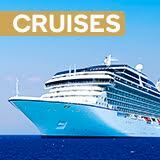 Upon arrival, you’ll be met by a tour representative and transferred to your hotel for check-in. Head for Polonnaruwa this morning, visiting the Pinnawala Elephant Orphanage en-route where you’ll be able to feed baby elephants breakfast before witnessing them bathe in the river. Continue onto Hiriwadunna where you’ll learn about local village life and feast on an authentic lunch. Take a ride in a bullock cart through a scrub jungle, and wade through a local stream before crossing the lake in a traditional Sri Lankan oruwa. Cap it off with a farm visit to learn about crop harvesting and taste authentic village cuisine prepared by the farmer’s family, savouring freshly pickled products and local herbs cooked over a claypot. Evening Safari – see the Minneriya National Park come alive by night, where you’ll get the chance to see up to 300 different species of Asian elephants, monkeys and birds (AUD $60 per person). Climb the lion staircase up the ancient stone fortress of Sigiriya (Lion Rock) this morning, where a polished ‘mirror wall’ inscribed with ancient poems and stunning mountain views await at the top. Enjoy a local lunch (own expense) before an afternoon of sightseeing in Polonnaruwa. Once the royal capital with a rich heritage spanning over 1,000 years, there’s plenty of ancient ruins and sights to see, starting with the King Parakramabahu Palace. Proceed to Kandy after breakfast, stopping at the Dambulla Rock Cave Temple en-route. Standing over 100m high, you’ll enter the cave by following the stone steps carved into the side of the rock, stopping to admire the breathtaking surrounding views on the trail. Head for a Spice Garden in Matale afterwards, where you can unwind with a head massage and shop for Sri Lanka’s aromatic spice blends. In the evening, visit the golden-roofed Temple of the Sacred Tooth Relic, housing the tooth of the Buddha guarded in a gold casket. Visit the Silk Factory and Gem Museum in Kandy this afternoon, famous for its precious gems including the world renowned Ceylon Blue Sapphire. Eat lunch locally (own expense) before enjoying an evening of guided sightseeing around the city. Head for Nuwara Eliya this morning, visiting a Tea Factory Plantation where you’ll learn about the production of Ceylon Tea along the way. Hidden away in the central mountains and once a summer retreat for 19th century British planters, Nuwara Eliya is the resort capital of the hills. Lying in the heart of ‘tea country’, this quaint English-style town is a great base for exploration in the hills. Spend the evening walking around Gregory Lake at your leisure. Enjoy breakfast at the hotel before traveling to Yala, stopping off at the Ravana Waterfalls in Ella en-route. Eat lunch at a local restaurant (own expense) before checking in to your hotel and spending the afternoon exploring at your leisure. 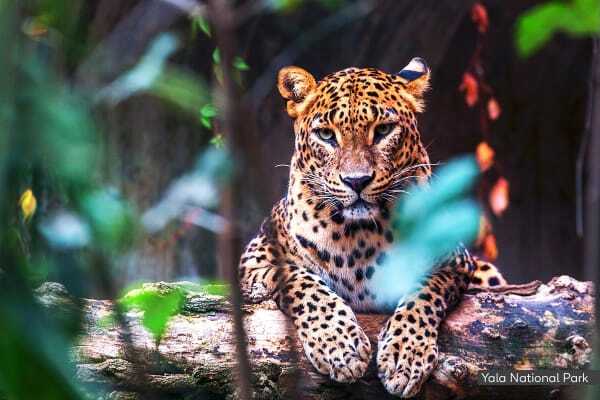 Explore Yala National Park via a jeep today, home to an abundance of wildlife and stunning natural scenery, including leopards, sloth bears, herds of elephants, buffalos, sambar, spotted deer and crocodiles. Leave the jungle behind as you head for the beach today. En-route, visit the Dutch Fort of Galle, the National Maritime Archeological Museum and the Galle Lighthouse. Spend the day relaxing and unwinding on the beach at your leisure, perhaps partaking in a thrilling Banana Boat or jet ski ride! Kickstart your morning with a Balapitiya river cruise, gliding past untouched tropical islands abundant with mangroves. Stop off at the Kosgoda turtle hatchery where you’ll be able to meet baby turtles and even get the opportunity to release them back to the beach! Soak up some last minute tropical rays and breezes before you transfer to Colombo for your late night flight home. 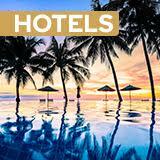 Feel free to spend the day at your leisure in Colombo, perhaps doing some last minute shopping and sightseeing.